Your Cross Town Movers/ Bekins Van Lines representative will also help to define a transit protection option that works best for your interstate move. You can choose standard coverage ($0.60 per pound @ no cost), or choose the security provided in our "For All It's Worth" transit protection. With this option, your goods will be covered for repair, replacement or reimbursement against loss or damage for up to 100% of their current retail value, without depreciation and with maximum reimbursement up to the shipment value you declare. Having proper transit coverage will provide you with additional assurances that your family is protected. 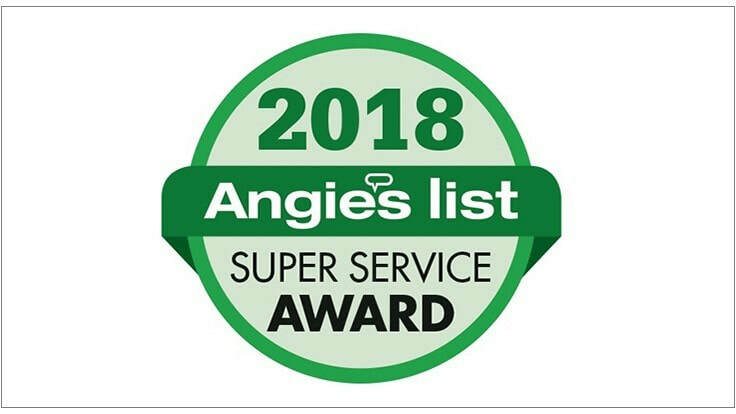 Our goal is to deliver your household items to your new home in a safe and timely manner. Although Cross Town Movers and Bekins Van Lines take every measure to assure that your items arrive at your new home without incident, sometimes damage occurs. ​To be sure that your goods are protected, we offer various level of transit protection from full value protection to basic liability protection. You choose what's right for you. If an item is lost or damaged during your move with us, our "For All It's Worth" full-value protection offers you the full replacement value of items at today's replacement cost, without depreciation up to the dollar amount of value you declare, or repair. In addition, this coverage extends to "pairs and sets", where if one item in a pair or set is damaged beyond repair or is lost and an exact replacement cannot be found, we will replace the entire set. The cost of this protection depends on the declared value of your shipment and the deductible you choose. This option gives you the peace of mind you need to be assured that if anything happens, you'll be protected. Basic Liability Protection is free of charge to you and provides for the replacement or repair of an item at $.60 per pound per article and depreciation applies. An example, you have a sofa weighing 150 lbs. which costs $800. If it is damaged during the move, you'd receive $90 if you select basic liability coverage and up to $800 if you had "For All It's Worth" full value replacement coverage. Please be aware that Bekins transit protection excludes inherent vice, climatic conditions and cartons that are packed by owner or a third party. Also known to Bekins as, "For All It's Worth" valuation protection. 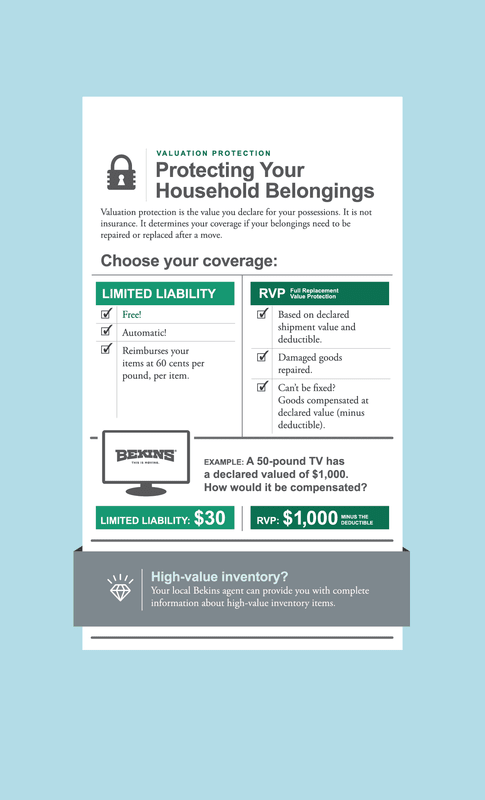 ​Full-value protection provides a higher level of compensation if there is any damage to your items, and is a great way to protect your move. Unlike insurance, we’ll place a dollar amount on your items based on a declared value that you set as well as the deductible level you choose. Our Full Replacement Value Protection (RVP) policies are based on a release value of $6 per pound. For example, if you choose to purchase RVP on your shipment that weighs 10,000 pounds, your shipment’s default value is $60,000. You can increase that value to a larger amount if you choose to do so. You’ll need to elect your valuation coverage and deductible levels prior to your items being loaded onto the moving van. Your local agent salesperson will quote you a price for the valuation level you choose on your shipment, and that cost will be added to the overall cost of the shipment. Payment for your shipment is due prior to delivery. If there is any damage, your belongings are repaired or replaced at the value declared minus the chosen deductible (if applicable). If the item can’t be repaired, then it will be replaced. If you’ll be moving anything expensive or easily damaged, it’s an excellent idea to consider full protection. It’s just one more way we help make your move worry-free. This means that the carrier is not responsible for any damages which are inherent to the item being shipped. The mechanical condition of appliances or electronics cannot be established prior to a move, therefore unless there is exterior damage noted about the items or cartons, it is assumed that it is in working condition. Any damages which are the direct result of change in temperature or humidity are beyond the carrier's control. Unless the carton is damaged, Bekins is not liable for any items that have been packed by someone other than Bekins. If the carton shows visible damage, it should be noted on the inventory and the carton(s) and damaged items must be retained for our inspection. The choice is yours; however, why would you choose anything other than full value protection coverage? Your Cross Town Movers/ Bekins Van Lines representative can explain these valuation coverages in detail so that you make the decision that's right for your family. 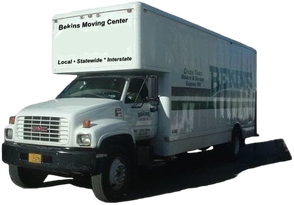 Cross Town Movers and Bekins have developed special procedures for preparing and shipping items of high value. Items of high value are considered to have a value in excess of $100 per pound. Items typically considered to be of "high value" include items such as jewelry, furs, antiques, crystal, silverware, gems, precious metals, art and coin collections, oriental rugs, tapestries and collectibles. If you decide to include high value items in your shipment, you must notify your Cross Town Movers representative before packing day or moving day, as you will need to complete and sign a "High Value Inventory" form. This form is needed to list your high value items so that you are assured that your articles are not limited to minimum liability. The High Value Inventory form will list signatures, serial numbers and manufacturer's marks. You may also want to photograph or videotape the high value items being shipped. You will be required to sign this document as well. When you pack your own goods, do not seal any cartons which contain high value items since the driver loading your shipment must be able to verify that the items listed on the High Value Inventory form are contained in the carton. On moving day, the driver will seal the carton and assign an inventory number in your presence. ​NOTE: Most households won't need to use the High Value Inventory form, because most household items wouldn't count as "high value", in valuation terms.